We spend hundreds of hours per year under the water in Laguna de Apoyo, in counts of fish, documentation of the quality of the habitat where they live, the vegetation found there, and yes, even in retrieving the trash that folks discard which ends up all along the lake bottom. Here is a small collection of photos which show what we see when we are down there, in the most beautiful spot in Nicaragua. In the photoessay below, you can experience what one of our interns saw during a study of the fish with the director of the Gaia Program, Dr. Jeffrey McCrary. Dr. McCrary is leading an international team in the study of the fishes of Laguna de Apoyo, and to date five new species have been discovered as part of the program. These fry of an Amphilophus zaliosus pair recently hatched in a nest hole which is often seen with babies. Lots of fish are hanging out in this site, including a probable male Amphilophus zaliosus in breeding coloration in the center of the photo. Counting fish along a transect. Juveniles and nonbreeding adult Amphilophus seek refuge under rocks in Laguna de Apoyo. Breeding season is approaching, and breeding pairs are forming. A pair of Amphilophus zaliosus are in the foreground, and a pair of jaguar cichlids, Parachromis managuensis, are in the background. As can be seen from the photos, several Midas cichlid species are locally abundant in the waters of Laguna de Apoyo. Of the six species recognized in Laguna de Apoyo in this group, the most abundant of the group in most locations is the little Apoyo cichlid, Amphilophus astorquii. Other fish species are in the lake, too: Atherinella sardina, Poecilia sphenops, and Parachromis managuensis, as well as some invasive species. A multispecies school of Amphilophus cichlids. The species of Amphilophus cichlids in Laguna de Apoyo vary by body shape, spot pattern, and background colors. Dozens of cichlids are always under this rock! Much of the lake bottom is covered with recently eroded sediments which cover the rocks and destroy all the high-quality habitat. Furthermore, ordinary garbage accumulates along our transects, such as this plastic cup, sold by the local bars. In some areas where waves clean the substrate, the lake bottom is covered with fine mud or sand. Fragments of snail shells (Pyrgophorus coronatus) litter the surface in many places. Snails are an important component of the diets of the Amphilophus species flock in Laguna de Apoyo. Filamentous algae has displaced Chara vegetation along the bottom in much of the lake. We do not understand why Chara often disappears from the lake, although it is known that tilapia will consume large quantities of it. In shallow areas with small rocks, juveniles of the invasive species Gobiomorus dormitor abound. Many shallow areas are covered with snail shell fragments, demonstrating the abundance of snails in Laguna de Apoyo. A human-altered waterscape in Laguna de Apoyo. Filamentous algae and a plastic beverage bottle displace native fish and vegetation. Silversides, Atherinella sardina, put on a show in the water column. Silverside schools may exceed ten thousand individuals. Here is the text from an article by our volunteer and student of Apoyo Spanish School, Elizabeth Loudon, which appeared in Mongabay. Laguna de Apoyo, a volcanic crater lake between two of Nicaragua’s most populated cities, is known as a tourist destination for locals and backpackers. This section of tropical dry forest is part of a corridor that is vital for many long and short distance migrations. Unbeknownst to many visitors, this site is also rich in pre-Columbian history and biodiversity. Ancient Chorotega petroglyphs remain intact and often unvisited, wrapped in the roots of chilamate trees. The vibrant Turquoise Browed Motmot, the national bird of Nicaragua, can be sighted eating Jacote fruits when they are in season. Since the creation of the reserve in 1991, Estacion Biologica Proyecto Ecologico has produced research and partnered with the Ministry of Environment and Natural Resources to protect the threatened ecosystem. Currently funded by the Nicaraguan Organization FUNDECI, it is the only research facility in the reserve. This protected area is home to a variety of flora and fauna, some of which evolved inside the 24,000 year old crater. Many unique species of fish have been discovered within the freshwater laguna, but there are still plants and animals that are yet unstudied. Unfortunately, Estacion Biologica struggles against development and environmental degradation within the reserve as scientists and volunteers from around the world attempt to learn about this seldom studied ecosystem. Funding can be scarce for research and outreach programs, and there are many paradigms to battle. Promoting awareness and providing environmental education for the community is a massive effort. Considering the problems with waste disposal nationwide, the Nicaraguan Government has recently adopted slogans in an attempt to encourage people not to litter. While this represents a step in the right direction, there is much progress left to make before Nicaragua adopts an anti-littering culture. Estacion Biologica is allied with the local high school, which has recently begun to collect plastic bottles for recycling. The teachers and students benefit from the money that the recycling earns, as well as from the value of the program for teaching the benefits of environmental sustainability. The students within the local schools often participate in service activities like lake clean ups and reforestation projects. This type of community engagement allows them to gain experience caring for the Laguna. Teaching Earth Rights and helping Nicaraguan youth to see the interconnectedness of actions and environmental impacts is no small task. While we are all victims of the tragedy of the commons, it is especially challenging to address environmental issues in developing countries. Problems such as deforestation and waterway pollution, common to many developing countries, weigh heavily on Nicaragua. While the government is responding to some of these problems, it faces many economic challenges that often inhibit preservation efforts. 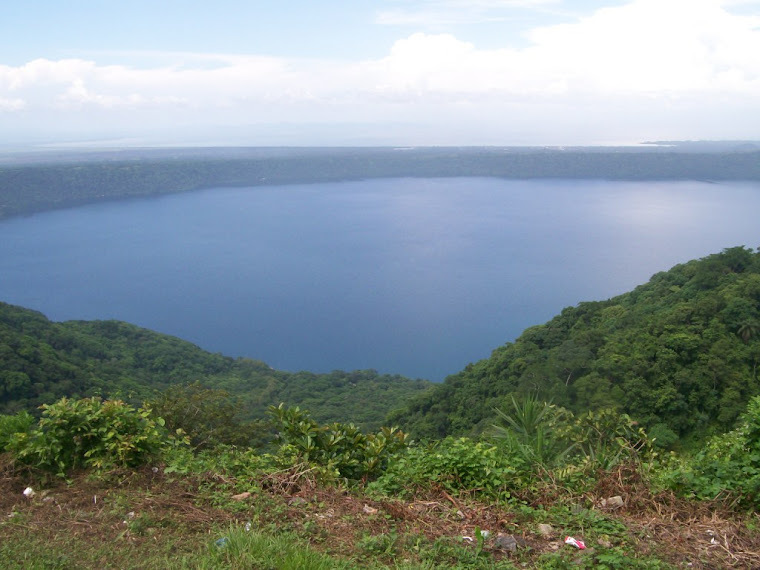 The Laguna de Apoyo Reserve is just one at risk area, among the 78 protected areas in the contry. Nicaragua is the poorest country in the the Western Hemisphere behind Haiti, but it contains many biodiversity sites that require protection. In spite of the many challenges, many small organizations like Estacion Biologica continue to make a small but meaningful impact.The increasing popularity of Nicaragua for tourism could represent a threat to the environment, but perhaps it is possible to nurture a symbiotic relationship between tourism and nature. Laguna de Apoyo is a hidden gem that retains a rare exotic charm. Tourists are attracted by the opportunity to watch howler monkeys feasting on mangoes in the trees above their heads. The fireflies come out in abundance at night, especially before the rain. Hopefully, with the efforts of local nonprofits like FUNDECI, these environmental treasures can be preserved for future generations.